Kerala referred to as God’s own country holds the title not just on the premise of its beautiful backwaters, its perfect climate, mesmerizing hill stations, and tranquil nature of the houseboats. The food of the land has a major influence on its culture and is the perfect reflection of the state’s traditions. Kerala’s backwaters offer more than just the aesthetics. They are famous for the fish, in particular, the Karimeen or the Pearl spot fish. For this reason, the dish from the fish was instantly popular. Karimeen marinated with red chillies, vegetables, spices, and a tinge of lemon, baked in leaves to give it the authentic flavor. Staple item of Kerala cuisine that you simply cannot resist is Appam. It is every mother’s signature dish and features fermented rice flour cooked in coconut milk. To balance the sweetness, the appam is served with stew that features vegetables, spices, and shallots cooked in coconut milk. This curry will be found listed in the menu of every breakfast serving restaurant. One of the local favorites, Puttu and Kadala is a staple item. Steamed rice-coconut cakes (Puttu) are served with the kadala curry which is made using black chickpeas and shallots cooked in coconut milk. A famous coconut milk-based sea food delicacy is the Fish moilee. The kingfish is marinated using turmeric, chili powder, and oil. The fish is then fried and cooked in coconut milk, along with a spice mix. Biryani is a classic dish that celebrates the perfect combination of meat, spices and rice. Thalassery, the dish’s first name is actually a sea port in Kerala and is the origins of this dish. The rice for the Biryani is known as kaima and has a great fragrance. Meat is cooked with the masala such that it completely absorbs it and is then allowed to cook with the rice on a low heat. Featuring on the menu of dishes to be made on Onam, the state festival, the Erissery lentil curry is made by using sliced yams, pumpkin, dried lentils, grated coconut, chilli, cumin seeds, and garlic, all cooked together and served with rice. Kerala loves their seafood. Chemmeen or Prawn is the staple curry of the Malabar region. Malabar is the region of origin for the Malabar Parotta, a perfect side dish to the Prawn curry. The stock for the dish is made by blending fenugreek, fennel, black mustard, chilli, all cooked in coconut milk to which brindleberry, raw mango, drumsticks, and marinated prawns are added. This curry is the traditional Beef curry and is made by tenderizing pieces of beef in a tomato, onion, garlic, and a spice mix. Even though Beef is rarely eaten, the curry is one of the popular dishes. This dish is best had with Malabar Parotta. Parotta, a term famous across the north of the India, is flat bread that is made by rolling of plain flour referred to as Maida by using oil/ghee and water. Eggs are added to aid in the process of kneading in a few recipes. The resultant dough is beaten and flattened. Onto the sweet side of things! Payasam is a dessert served at the end of the meal on special occasions and gatherings. Prepared with Palada, it is a stock dessert on Onam. It is prepared by using Palada mixture which is fermented milk, rice flour, and sugar, cooked in ghee. 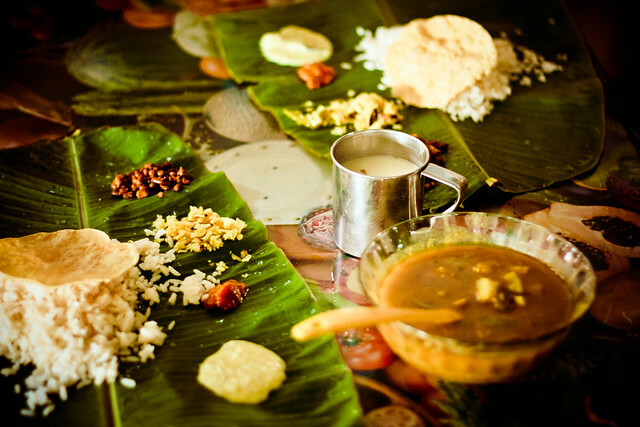 Coconut milk, sea food, and authentic spices define any Kerala food item. It is in there allegation that one finds the magic and flavor. The food items mentioned all offer an amazing visual and sensory experience to the person eating. Don’t miss out! All the dishes look and sound amazing! Your descriptions are so vivid I could almost taste them. Sounds great.I will look forward to reading future posts.